A new molten salt reactor concept developed by US start-up Transatomic could change the face of nuclear power. The Waste-Annihilating Molten Salt Reactor has the potential to create energy from existing nuclear waste while enhancing safety and efficiency. Transatomic co-founder and CEO Russ Wilcox explains a potentially industry-changing idea. WAMSR creators Leslie Dewan and Mark Massie were inspired by Fukushima to find safer reactor designs. Russ Wilcox is Transatomic's co-founder and CEO. Image courtesy of Transatomic. A diagram showing the WAMSR's core energy generation process. Image courtesy of Transatomic. Trasatomic aims to burn spent fuel to minimise the problem of nuclear waste and capacity-strained spent fuel pools. Image courtesy of Simone Ramella. When Russ Wilcox, inventor and former CEO of US electronic display manufacturer E Ink Corporation, attended a TEDx talk in New England at the tail end of 2011, he was, in his own words, "looking for a change-the-world kind of idea". He might have expected it would take a while to come upon the perfect idea to revolutionise an industry and launch a new business, but as it turns out, over the course of their 20-minute presentation, the two speakers onstage convinced him that they had exactly the change-the-world idea he’d been looking for. "Mark and Leslie were inspired by events at Fukushima; they knew there were other types of reactor technologies that would be safer." The speakers were Leslie Dewan and Mark Massie, two young nuclear engineering PhD students from the Massachusetts Institute of Technology (MIT), and their idea was the Waste-Annihilating Molten Salt Reactor (WAMSR). This new nuclear reactor technology promises vastly improved safety specifications, massive gains in efficiency and – most importantly – the ability to run on the spent uranium fuel waste generated by other nuclear plants, which is sitting unused at dozens of sites around the world. "We started to meet," says Wilcox. "We met once a week for about six months and it became clear as I studied the industry and the technology that this was something very special." And so, in May 2012, a new start-up called Transatomic was born, with Dewan and Massie handling the science and Wilcox working to push the business forward and turn their idea into a reality. Although the concept and the company is still at the earliest seed stages, the Transatomic team is hoping that the WAMSR will revolutionise the nuclear energy sector and become the face of the clean, sustainable new nuclear ideal in the coming decades. Here, Wilcox explains the ideas behind the WAMSR, as well as his vision for bringing the technology to market. Chris Lo: How is this reactor design different from conventional light water reactors? Russ Wilcox: Mark and Leslie were inspired by the events at Fukushima; they knew there were other types of reactor technologies that would be much safer for the public. They realised that although molten salt reactors had been trialled in the United States in the 60s, there were some commercial barriers when it was demonstrated. The bottom line is, the technology was recommended for commercial scale-up, but it was a pretty bulky atomic core, and at that time safety wasn’t as important – we hadn’t had Three Mile Island or Chernobyl or Fukushima. Inspired by Fukushima, they wanted to see what we could do about waste. The original [molten salt] reactors used 33% enriched uranium, but obviously with non-proliferation, people would really like you to have very low enriched uranium. And if you want to be able to burn spent fuel, you have to be incredibly low. Spent fuel is equivalent to about a two percent enrichment level – what goes into a civilian reactor is something like 4.5%, and then they burn it. And within a couple of years, it gets down to two percent and they can’t burn it anymore, they yank it out and throw it into storage. During that time, only about one percent of the energy potential of the fuel is burned. CL: How does the WAMSR address this problem of waste? RW: My analogy is that the current situation is a bit like candles on a birthday cake – you light them, sing happy birthday then blow them out and throw them away. If you were to take all of the candles of all the nuclear plants in the world and throw them away over the last couple of decades, it’s a staggering amount of uranium – 270,000 metric tonnes of spent nuclear fuel are around the world right now. "Spent fuel is equivalent to about a two percent enrichment level – what goes into a civilian reactor is something like 4.5%." In the United States we have about 70,000 tonnes – that’s enough to power all electricity in the country for a century. It’s a massive amount of waste, to think that we’re only using one percent of the energy of the fuel. So they started to redesign the reactor to burn waste, and that was definitely the most interesting and exciting feature. That is helpful backwards, because it means we can clean up what we’ve created in the past, but it’s also helpful forwards, meaning we can avoid the creation of waste in the future. 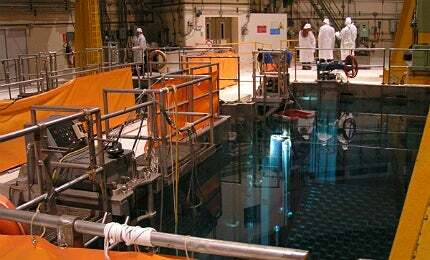 In the United States, the spent nuclear fuel pools, where we store fuel, are about 90% full right now. So we’re about to spend money converting all of those to dry storage, and it’s just going to continue to accumulate waste around the sites of each of these nuclear reactors. In order to fix nuclear, we really needed to have an invention that was simultaneously revolutionary in the areas of safety, waste and cost. They started with a technology that was great for safety, they improved it so it would be great for waste, and then in doing so it became very efficient, so it’s also cost-effective. So I think we have the trifecta you need to turn around the nuclear power industry. CL: Molten salts are playing a role in a range of renewable power technologies – what role does molten salt play in the safety of the WAMSR? RW: Basically, salt wants to be solid, so it takes a lot of heat to make it liquid. It’s a good liquid to move lots of heat, and that’s why it’s thought of to concentrate solar and a few other applications. "You could actually extract uranium from seawater as an economical source of energy." In our case, why is it a huge safety advantage? In today’s reactors, the fuel gets very hot. You put uranium into a solid brick, the uranium oxide ceramic. Ceramics do not conduct heat very well, so if you look at a fuel pin in the centre line, it’s about 2000°C, and on the edge it’s about 330°C. And that’s the temperature that most light water reactors work at – 300°C – because even though they pressurise it, if it got any hotter the water would turn into steam. So, think of it – you have a fuel that’s hotter than the boiling point of the coolant. That’s insane; it’s really kind of crazy! But that knife’s edge is what we’re all balanced on with the traditional technology. In the molten salt reactor you get to invert that; the fuel is liquid. Liquid conducts heat far better than ceramics, so there’s a beautiful heat conductance, which means you don’t have any fuel up as high as 2000°C – we’re at 700°C. And instead of the rod being very hot in the middle but cool around the edge, our liquid is uniformly warm, so our outlet temperature is up at 700°C, as compared to the outlet temperature of light water reactors at 300°C. That actually turns out to be the most important factor in the cost of nuclear reactors, because the higher your outlet temperature, the more efficient you are at making electricity, and the turbine and all the water you need for cooling, that is a huge cost driver. So just by going to a higher outlet temperature we get a big win on cost. It doesn’t want to be liquid in the first place, and it definitely doesn’t want to be a gas. Now we’ve got a huge margin to boiling, which means it’s vanishingly unlikely that you’ll see molten salt reactors ever create a steam explosion. You’ve got hundreds of degrees of comfort. CL: Do you think there are some regions or countries that will be particularly receptive to the ‘new nuclear’ message? RW: Everyone I’ve spoken to has been very receptive to the idea of a nuclear reactor that does not create waste. To be clear, there’s a very tiny amount of waste; we might go from 20 tonnes down to 20 pounds. We’re not saying zero waste, but we are essentially solving the waste problem. And the majority of the waste we have has a half-life of less than 300 years. "The other technology burns maybe one to three percent of a fuel rod; we burn up to 98%." Everybody seems interested in that. Who would be the best for this? I think one of the aspects of this is because we’re able to burn so cleanly and completely – the other technology burns maybe one to three percent of a fuel rod; we burn up to 98% – what that means is you’re getting 30 times more electricity out of the same uranium. Who cares about that? Well, if you’re a country that doesn’t have a lot of uranium, for example the UK, Japan and India – these countries don’t have vast uranium deposits. If you can get 30 times more electricity, you can actually extract uranium from seawater and that will be an economical source of energy. So it’s very good for islands! But I also see it as a good fit for countries like France and the United States and other countries that have a long history of nuclear energy because, first of all, there’s plenty of waste. And secondly, they all have to deal with this issue of ageing power plants. The average age of nuclear plants in the US is 30 years, so they’re designed for 40 years and most of them could probably be extended to 60, but it’s not clear it’s going to be able to go beyond that. So we’ve got 20% of this country’s base that’s going to have to turn over into something. We have this vision of being able to put Transatomic reactors right on site in the old locations – how elegant would that be, to put a new reactor there that provides the same amount of energy, but uses the waste already on-site to do it? CL: Where is Transatomic in terms of progressing the business? "In the US we have enough spent nuclear fuel to power all electricity in the country for a century." RW: We’re in a seed stage. The next step for us will be to raise a Series A financing round; we’ll raise something like $10m and we’ll go and run experiments at the bench level, which will prove or disprove that the couple of new innovations we’re bringing work in the way we say and they’re not going to produce any unknown complications. Assuming that works as we think it will, the next step will be to develop a working reactor, which will be a small-scale one. If that goes well, we will have shown that all the benefits we’re describing are there, that we’re able to get operating data from a working example, then the next step will be to design the commercial version and to get that licensed and build the first unit. The best time to plant a tree is 20 years ago, but if you don’t have that, the best time to plant a tree is right away! On the other hand, one could say our timing is perfect, because the world’s going through – at least in the United States – a huge natural gas glut. So for the next decade, the nuclear industry has to contend with very cheap natural gas, and that’s sapping some of the momentum, not just for nuclear but for everything. I think, in many ways, that’s the perfect moment for an innovator to take a couple of years to prove their innovation works so we can leapfrog and be ready a decade from now with the right product. Google is investing an additional $600m in its data centre in Lenoir, North Carolina, and aims to expand clean energy options for companies in the US state through utility-offered ‘renewable energy tariffs’.